Edinburgh is a great city and made even better by all the dog friendly places you can go to. There are so many to choose from it’s difficult to know where to start. If you are looking for the area with the most dog friendly places then that’s easy, just head to (the sunshine on) Leith. There are lot’s of dog friendly pubs, cafe’s and shops scattered around Leith all the way down to the shore. There are a lot of our “Dugs Welcome” stickers on Easter Road, you have the Manna House Cafe, the Filling Place, Cloud 9, Cornelius Off Licence and Eero & Riley. For bars or cafes, head down the shore and you will find Cafe Tartine, the Malt & Hops and Sofi’s to name a few. There is also Woodland Creatures, Boda Bar, Victoria and Windsor Buffet on the main street Leith Walk. For walks, one of our favourites is Holyrood Park and Arthur’s seat. There are some great pubs nearby to visit afterwards including the Holyrood 9A, Hemma Bar, the Kilderkin, the Regent Bar and the Auld Hoose. The Water of Leith is also a great walk which runs from Balerno all the way down to Leith. In Stockbridge there is the Stockbridge Tap, Hamilton’s, the Bailie and the Antiquary as well as loads of “Dugs Welcome” shops including Just Dogs (which supplies everything a dog owner will ever need). In the city centre, visit the Cambridge Bar for an amazing burger or check out Scotts of Rose Street. The Thistle Street Bar or the Bon Vivant are also good choices. In New town area, there is the Wally Dug and the Cumberland Bar. Also don’t forget to visit Broughton Street or you will miss out on Cafe Nom De Plume, Treacle as well as shops such as Vino, Curiouser & Curiouser and Concrete Wardrobe. 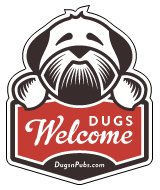 Bruntsfield is also another great place to spot “Dugs Welcome” stickers. Falko traditional German bakery is a must but you also have Henrick’s Bar as well as a few shopping options. If you want to get out of the city then look no further than (Costa Del) Portobello. As well as having a beach for your dog to run along it has one of our favourite dog friendly venues the Espy which is on the promenade next to the beach. You will also find Crumbs of Portobello on the promenade where you can pick up a liver cake for your dog! If you are looking for unique then there are a few choices. If art is your thing then you can take your dog to the galleries at the Summerhall Arts Centre in the Newington area. Summerhall also has a cafe and bar. If you need a bit of cooling down, the ice-cream cafe Affogato on Queensferry Street is the place to be. Last I heard they were working on creating a new dog friendly gelato! We are hoping one day you will be able to take your dug to watch a play at the Traverse theatre on Cambridge Street but for now were happy that you can take your pooch into the bar (one day!). If you fancy a dog friendly sightseeing tour then Edinburgh bus tours welcome well behaved dogs on board their tour buses. Visit their website at www.edinburghtour.com. This is just a small snap shot of what Edinburgh has to offer so to find more places browse our Dog Friendly Edinburgh Guide. Dogs (except for guide dogs and assistance dogs) are not allowed in Edinburgh castle. Historic Scotland advise this is “due to the volume of visitors”. Dogs are allowed to be walked in Princes Street gardens but must be kept on a lead at all times. Dogs can travel on Lothian Buses however this is at the driver’s discretion according to their Conditions of Carriage. All dogs must be on a lead. In our experience only 1 dog is normally allowed on the bus by the driver. Their conditions also state that the “driver may require an animal to be taken off the bus at any time”. The dog policy for Edinburgh Trams is the same as for Lothian Buses. Dogs are allowed to travel on trams however it is at the driver’s discretion. Only guide dogs, hearing dogs and other recognised assistance dogs are admitted. Dogs on leads are allowed to walk the grounds at the National Museum of Flight in East Lothian, however aren’t permitted to go into any of the hangars. Guide and hearing dogs are the only dogs allowed in the terminal buildings. The airport provide some information on travelling with your dog on this page if you need to make special arrangements. Dogs are not allowed in the grounds of the Gallery or inside the gallery itself.